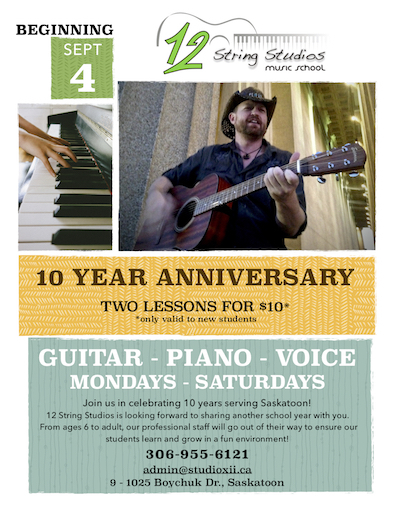 Join us in celebrating 10 amazing years in Saskatoon by enjoying two intro lessons for only $10* for ages 6 to adult! Choose any guitar, piano or voice lessons Monday - Saturdays. We are very proud to have seen a successful transition into our new location with fresh renovations and fresh faces. This year we've added five new staff members to join our team and work together to create a positive, fun and professional experience for your family. 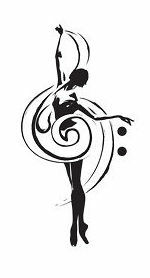 Join us in our programs of dance classes the likes of; Ballet, Jazz, Hip Hop, and Tap Dance as well as music lessons in guitar, piano and voice/vocal lessons. 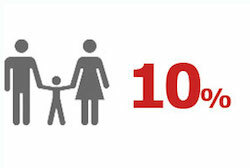 Registration is now open to contact us today to inquire and get your family registered! We are pleased to announce that we are merging two of our locations to provide both music and dance education under one roof! We continue to grow and find new ways of bringing together a great team of instructors to share their knowledge and experience with our students young and old! We have expanded into an additional suite at our head office located at #9 - 1025 Boychuk drive and our music school 12 String Studios will be moving into the new space in suite #10 beginning September 1st! For all your music and dance educational needs, contact us to get you sorted! We are pleased to get back rolling after a couple weeks of the holiday season. Our office is open Monday - Thursday, 3pm - 9pm to assist you is registering for our programs. We currently have a special music introductory offer of $49 for four weeks of your choice of guitar, piano, or voice. We have successfully celebrated the end of 2015 with two fun music recitals and the completion of our plans to order costumes for our dance families. Our office is now closed until Monday, January 4th which then our regular hours will be reinstated. Two great promotional offers in Piano Lessons and Dance Classes! We have two great offers this Fall to celebrate adding five new teachers to our school this year. 1) We have a four week Piano Intro for only $49. For more info on our teachers, visit 12 String Studios Website! 2) We are offering a FREE TRIAL DANCE CLASS for ages 3 - 15 in Ballet, Jazz, Tap Hip Hop and Musical Theatre. Contact the Aspire Dance School for more info or check out our schedule by visiting their website! Free Dance Workshops August 24th - 31st! Visit the Aspire Dance School Website for more info by clicking here. Our office is now open for Fall Registrations! With new office hours for your convenience, we are now open Monday - Thursdays, 3pm - 9pm! Please come on in and inquire about our performing arts programs in guitar, piano, voice, ballet, jazz, tap, hip hop, and musical theatre. Our professional staff are here to help!